Magnetic Analysis Corporation has been advancing the science and technology behind nondestructive testing for over 90 years. 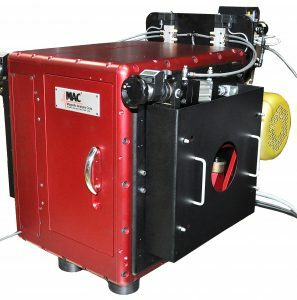 On the world stage, MAC® is recognized as a major resource for eddy current, electromagnetic, flux leakage and ultrasonic inspection systems for testing metals. Dedicated to a production-oriented approach, MAC offers both individual instruments and complete systems that incorporate material handling and controls, as well as nondestructive testing. Our focus is on our clients’ expectations for superior technology, reliability and a thorough understanding of their product and in-plant conditions. Partnering with them, we develop a test system that is the best one to meet both their specifications and their internal needs. Three impressive, state of the art facilities form the backbone of our company: MAC’s ISO 9001-2015 certified manufacturing and engineering facility in Elmsford, New York; a manufacturing and ISO/IEC 17025:2005 laboratory certified plant in Boardman, Ohio; and Magnetic Analysis Nordic’s manufacturing plant in Östersund, Sweden. Our products and testing instruments are used in countless countries and territories, in plants and mills where wire, tubing, bars and metal parts roll through automatic inspection systems without missing a beat. In addition, MAC’s global network of field engineers and experienced representatives are always available to locally supply custom services, installation, routine maintenance, or repairs. This support staff gives MAC the unique ability to provide the highest level of personalized service, just about anywhere in the world. Maintenance service can be provided for most systems by a service contract, or on a per call basis. Our testers and services are also offered through MAC’s unique leasing program, which includes both equipment and service in one package. 1928 Magnetic Analysis Corp. is founded in Long Island City, NY, by William Gould and William Gould Jr.
At that time, most testing inspection involved “sampling” techniques that essentially destroyed part of the product in the process. An evaluation method that would permit products to be used after testing proved to be a very attractive and successful idea and, as a result, a group of patents was developed for nondestructive testing of steel bars. Translating this NDT concept into a viable tester took six years of research and development. 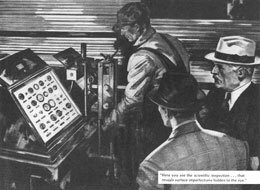 1934 MAC introduces the first successful nondestructive tester to identify cracks in steel bars. Using two coils and a galvanometer, the system applied an electric AC field to the bar and measured changes in permeability. Housed in a wooden box, the strange new scientific development met with considerable skepticism from early customers, but MAC believed so strongly in the tester that the company offered the equipment on a lease basis so that customers would not have to make a capital investment. With this incentive, Union Drawn Steel became the first company to install a MAC electromagnetic tester in 1934, and MAC’s concept of an operating lease for NDT equipment became a successful part of the company’s marketing program—one that remains in place today. The 1930’s-1940’s The use of NDT expands in the U.S. steel industry, spurred by demands for ordnance testing in World War II. In a two-page advertisement in TIME Magazine in June, 1940, Jones and Laughlin Steel Corporation of Pittsburgh PA featured Magnetic Analysis Corp.’s electromagnetic tester and described the merits of the test method for inspecting cold finished steel bars for cracks. During this period, MAC continued research and development that led to expanded electromagnetic testing capabilities for grade and hardness inspection. 1953 MAC introduces the first commercial eddy current tester in the U.S., a major advancement in NDT technology. This new eddy current technology measured the material’s conductivity instead of permeability, leading to a more reliable inspection for short surface defects. It also enabled non-ferrous metals such as copper, brass, stainless steel and aluminum to be inspected. 1959 MAC launches Rotomac®, the world’s first spinning probe eddy current tester. The challenge of detecting long, continuous defects in wire and rod led to the company’s development of the first rotary probe tester. 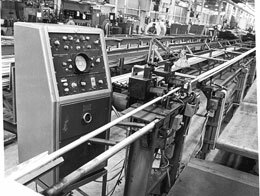 MAC’s expertise in rotary techniques continued to expand, and today the company’s high speed multi-test channel systems featuring eddy current, flux leakage and ultrasonic technologies are installed in plants throughout the world. 1964 MAC opens its plant in Mt. Vernon, NY, gets a new president, and continues to expand operations. 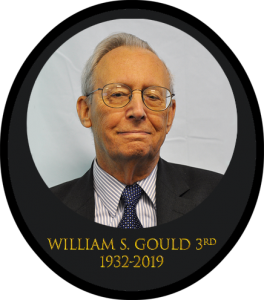 During the 1960’s and 1970’s, under the direction of William Gould 3rd, MAC successfully expanded into overseas operations and introduced its test systems to Europe and Australia. The first European-based equipment was installed at British Timken by MAC’s UK subsidiary in 1962, followed by other subsidiaries being established in Italy and Australia. At home, manufacturing operations were later expanded with the opening of an Ohio plant in 1975. 1968 MAC introduces the first eddy current tester with phase gating and filtering. In a major advance, this tester allowed much greater selectivity in differentiating between test signals from defects, and noise and signals from other sources. 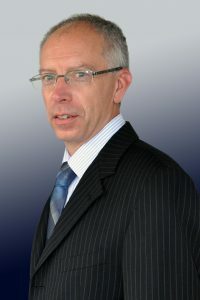 Further improvements added pulsed eddy current techniques that allowed for greater power to be applied so larger size materials could be inspected. The 1970’s MAC broadens its flux leakage product line. During this decade, MAC developed flux leakage detectors for military ordnance parts applications and for tube and pipe inspections, including OCTG. 1989 MAC develops its own line of ultrasonic rotary testers. 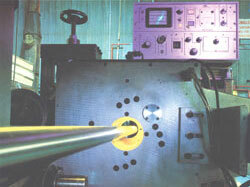 That year, MAC introduced Echomac® ultrasonic rotary testing for tube and bar. This was followed by the addition of the Echomac FD instrumentation series, which is now recognized the world over as the premier ultrasonic electronic testing system. 1992 MAC launches a fully computerized eddy current tester, a new benchmark for the industry. With its real-time, full-color graphic display, sophisticated control of test parameters and digital processing of test signals, this instrument brought eddy current testing to a whole new level of precision and sophistication. 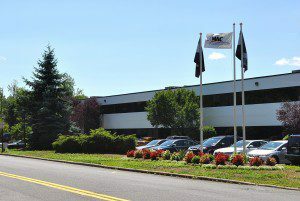 2010 MAC relocates operations to a larger plant in Elmsford, NY. Initiated by then company President Joseph Vitulli, MAC moved to a new facility which provided an 80% increase in space, and greatly expanded the company’s ability to manufacture and assemble large inspection systems and demonstrate them for customers. The move was critical in the company’s global strategy of offering the highest quality test equipment to meet growing demands for inspecting tube, bar, wire and other metal components. 2016 Dudley Boden appointed MAC President & CEO. Under the new leadership of President Boden, the company has broadened its technology and testing applications and taken on a renewed sense of commitment to 100% customer satisfaction. Our focus is on using our years of experience in metal manufacturing plants to partner with the customer, learning what their real needs are, and developing the best test system for the specific application. 2018 MAC delivers new products home and around the world. In the 2nd quarter of 2018, MAC shipped the first of three Rotoflux® AC Flux Leakage systems to a long-standing customer in Korea to inspect holt rolled bar. The new Rotoflux® AC, based on MAC’s many years of developing flux leakage technology, gives customers the ability to test products such as hot rolled bar with surface conditions that used to make finding shallow defects very difficult, if not impossible. The second and third units were shipped in the 3rd quarter to a longtime customer who manufacturers hot rolled black bar in the U.S. In the 4th quarter of 2018, MAC shipped out its first 25mm, 8 channel UT rotary with Echomac® FD6A electronics to a supplier of raw material for the medical industry. The design and manufacture of the 25mm unit increases MAC’s range of product UT inspection from 5mm up to and including 500mm OD. Today A global leader in NDT technology. MAC operates on a worldwide scale, helping metal manufacturers around the globe meet demanding specifications that require multiple technologies, including newly developed phased array UT and AC Flux Leakage, material handling, remote access approval, and monitoring. In Scandinavia, MAC’s subsidiary M A Nordic provides CE approved systems to customers throughout Europe, Russia and Eastern Europe. Asia, South America and India have also become key markets for the latest advances in NDT instrumentation.